The wobble board is an effective tool to strengthen and stabilize the ankle. The wobble board can be used in conjunction with a rocker board and a balance ball. You can utilize the wobble board as a preventative and rehabilitative tool to develop strength, stability and proprioception in the lower leg. 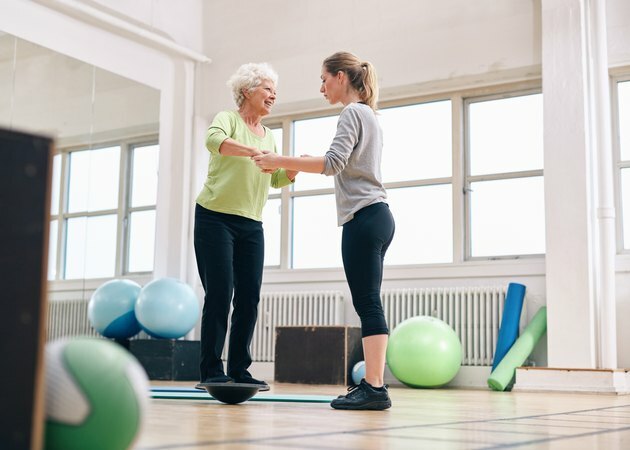 Dr. Jens Urlik Wester and colleauges, writing in the "Journal of Orthopaedic & Sports Physical Therapy," recommend discontinuing wobble board training if it becomes painful. Perform all exercises in a slow controlled motion and always maintain proper technique. Place your feet parallel to each other on the wobble board. Stand in good posture throughout all the exercises by retracting your shoulder blades, looking straight forward, and contracting your abdominal muscles by tucking your tailbone underneath you and pulling the front of your pelvis upward toward your belly button. Raise the longitudinal arch of your feet without curling your toes and slowly move the board forward until it almost touches the floor. Next move the board backward until it almost touches the floor. Repeat the forward-backward motion for 15 seconds, then rest for ten seconds. Every day execute 10 sets of 15 second repetitions with a 10 second rest in between. Stand in good posture and raise the longitudinal arch of your feet. Move the board to the left until it almost touches the floor, then move the board to the right until it almost touches the floor. Continue these motions for 15 seconds then rest for 10 seconds. Perform 10 sets of the 15 second repetitions with 10 seconds rest in between every day. Always maintain proper posture throughout the entire exercise and never let the board touch the floor. Stand in the correct starting posture with your feet in a parallel position but wider than on exercises number one and two. Move the board forward, then to the right, then backward, then to the left in a slow controlled fashion for 60 seconds. Rest for 20 seconds then repeat in the opposite direction for 60 seconds. Perform a total of three sets in each direction with 20 seconds rest in between. Execute the first three exercises daily for three weeks with perfect form. After three weeks you can perform exercises one, two and three with your knees bent and hands behind your back. Execute five sets of 30 second repetitions with 20 seconds rest in between. Stand in correct posture with one foot on the board. Raise the longitudinal arch of your foot without curling your toes, balance yourself on the board and hold a horizontal position for seven seconds. Perform five sets of seven second repetitions with each foot. Then perform the identical exercise for five more reps but close your eyes for the final four seconds of the seven-second repetition.